You probably are well aware that Ford’s F-Series pickup truck is the America’s top-selling vehicle. The company rarely misses the opportunity to pass on that information through print and over-the-air ads. But what do you think is the company’s No. 2 seller? No. No. No. No. And definitely no. Nope, Ford’s No. 2 seller is the Escape, which is still going strong since the company introduced it into the small SUV segment for the 2001 model year. In 2016, Ford reported sales of 307,069 Escapes, up slightly from 306,492 for the year before. That’s well behind the 820,799 F-Series trucks reported sold last year, but also comfortably ahead of the Fusion (265,840), Explorer (216,294), Focus (168,789), Edge (134,588), and Mustang (105,932). And the trend is continuing in 2017. The company recently announced it was cutting its usual summer two-week production layoff at its Louisville, Kentucky, plant to just one week because of stronger demand. Escape sales through May were at 129,805, an increase of nearly 3 percent for the same time period last year and the strongest start yet for the versatile vehicle that provides nice room for both passengers and cargo alike, especially for its class. Designers gave the roomy cabin a somewhat classier look with a push-button electronic parking brake replacing the large hand brake that rested alongside the center console. (It’s just back of the gearshift lever.) 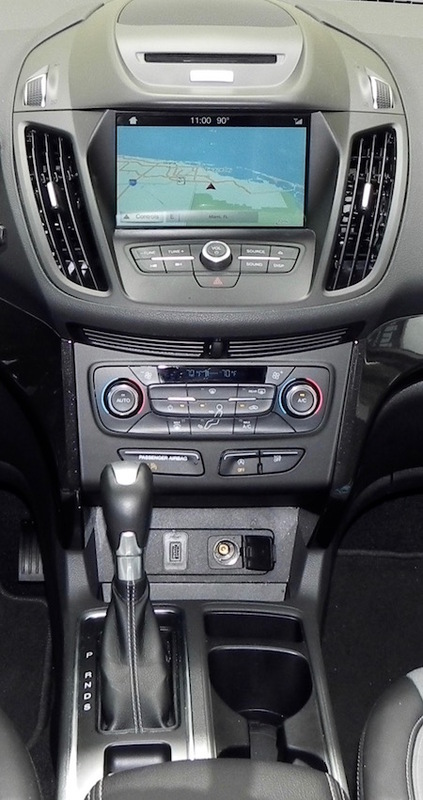 They also moved the gearshift back a bit to open up access to the climate controls. 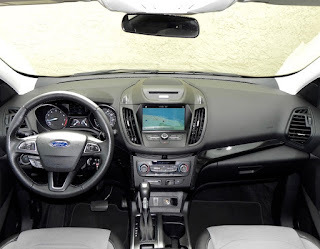 Other refinements include redesigned cupholders, a spot on the center console for a USB port and power outlet and controls on the steering wheel for operation of the phone, audio, cruise control, and information systems. The Escape is available in three trims, S, SE, and Titanium with SE likely hitting the sweet spot for most buyers. It offers more niceties than the base S, including the 1.5-liter turbo that boosts horsepower and torque to 179 horsepower and 177 pound-feet over the 168/170, respectively, of the S’s 2.5-liter naturally aspirated 4-banger. The optional 2.0-liter turbo takes the power figures up to 245/275, respectively. A six-speed automatic transmission with SelectShift capability is standard in all trims. Other standard features on the SE include dual exhaust tips, fog lamps, LED taillights, 60/40 split fold rear seat, dual zone automatic climate control, steering wheel mounted paddle shifters (imagine that! ), rearview camera, roof rails, and more. The Titanium edition picks up where the SE leaves off and among other things adds a foot sensor to operate the power lift gate (after all, pushing a button on the key fob is so demanding), keyless entry and ignition, a 10-speaker Sony sound system, and memory settings for the driver’s seat. 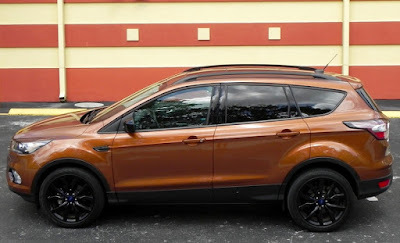 My vehicle for the week was the Escape SE which came with option packages that included such features as blind spot warning, a power lift gate, panoramic moonroof, and a voice-activated navigation system. That added $5,475 to the base MSRP of $25,100 for a total of $30,575 (including destination and delivery). That’s pretty much in line with others in the genre. Overall, it was a pleasant time. Operating the 1.5-liter turbo-4 in Sport (S) mode added noticeable punch to the driving performance, but even in Drive (D) the throttle responses were quick enough to assure safe entry into heavy traffic lanes. The 1.5L Ecoboost engine also offers decent enough fuel economy. EPA ratings are 23 miles-per-gallon city, 30 highway, and 26 combined with front-wheel drive compared to 21/29/24 with the base 2.5L and 22/29/25 for the more powerful 2.0L Ecoboost. That’s using regular fuel. AWD knocks off a couple of miles-per-gallon, of course. The cabin is very quiet — you can hardly notice with the stop/start kicks on and off — and roomy. Up to 43.1 inches of legroom is available up front, and the three backseat riders get 36.8 inches. Cloth seats are standard with leather optional. SYNC Connect is available as part of a technology package on SE models and is standard on the Titanium edition. It’s easy enough to operate and responds quickly and accurately to voice commands. 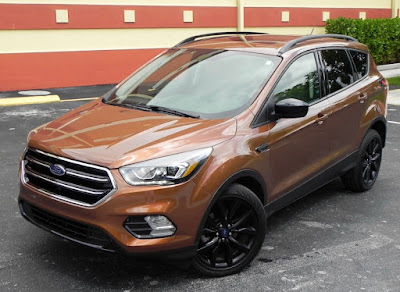 If you want to dress up your Escape a bit, for an extra $1,295 a Sport Appearance package adds 19-inch ebony black aluminum wheels, black headlamp and taillamp bezels, and black upper grille and side vents. 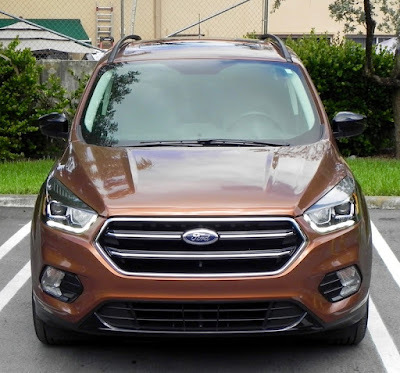 What I liked about the 2017 Ford Escape SE: Storage space is excellent. 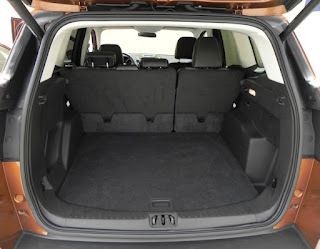 There’s 34.3 cubic feet of cargo volume behind the second row. Fold those seats and it increases to 67.8 cubic feet. The overall driving experience was excellent. 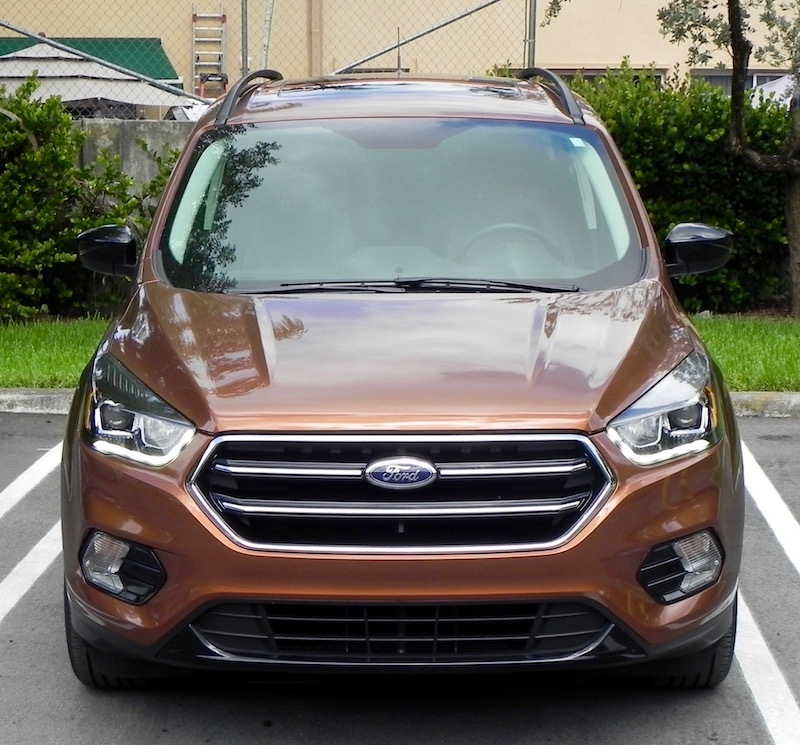 What I didn’t like about the 2017 Ford Escape SE: I know the dash looks cleaner with a minimum number of knobs, but I still like to have one to surf the radio dial. There is a knob to adjust volume, but not change stations. Would I buy the 2017 Ford Escape? Sure (but not this color). 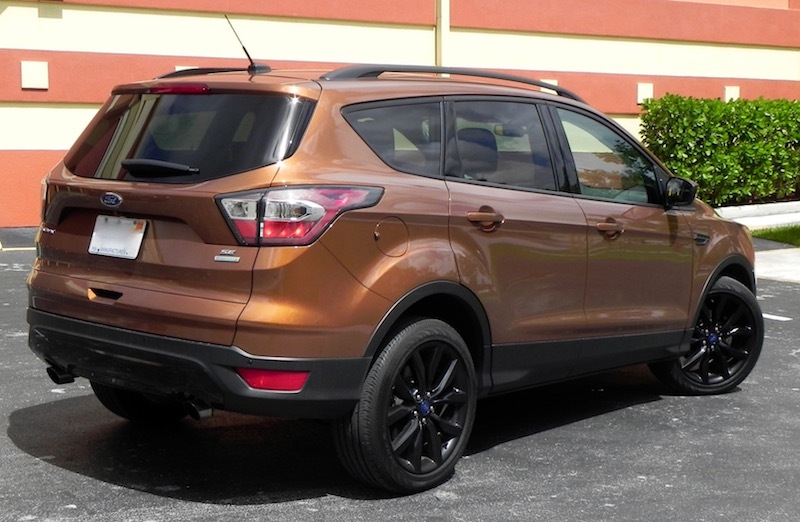 It’s a competitive segment with some really nice choices these days, and the Escape is among them. According to Shakespeare, a rose by any other name would smell as sweet. Maybe that works in cases of love — the quote is from Romeo and Juliet, in case you missed that lit class — but maybe not so much when it comes to automobiles. 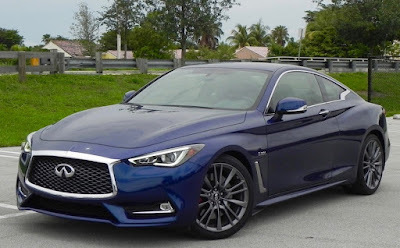 Consider, for example, the Infiniti Q60. When it morphed into the G37 because of its slightly bigger engine, the G37 coupe still carried a lot of verve. The anonymous reviewer for Edmunds.com called the 2008 G37 coupe “a hoot to drive” while praising the interior for its abundance of quality materials and high-tech features offered. Then a couple of years ago, when the company announced its policy of labeling its cars with a “Q” designation and its SUVs “QX” followed by a number corresponding to the vehicle’s place in the overall lineup, the G37 coupe became the Q60 and the G37 sedan the Q50. So what do we hear about the redesigned 2017 Q60? At least Automobile Magazine had good things to say about the “clean and elegant finish” of the interior. So what happened? Did Nissan engineers and designers take a dose of stupid pills along with the name change? After spending a week in the 2017 Infiniti Q60 Red Sport 400, I’d be hard-pressed to come up with 17 cars to put ahead of it in its class. First, it has the inherent sexiness of a coupe’s profile. You can even see a familial resemblance to parent company Nissan’s 370Z sports coupe in its profile. 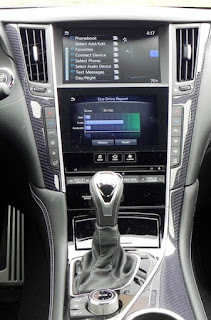 Next, inside it has the requisite luxury leather and niceties for its segment, like some carbon fiber trim touches. Door handles are placed at a convenient spot, and the steering wheel and shift lever get the full leather treatment. Riders in front get up to 43.1 inches of legroom while the two in the back, who are separated by a mini-console featuring two small cupholders and a small flat space for, um, well I’m not really sure that it would be for, get 35.1 inches of legroom and, despite the sloping roofline, 34.5 inches of headroom. Infiniti calls the overall theme for the cabin “driver-centric” and “passenger-minded.” I call it elegant and comfortable. The center stack features two screens for operation of Infiniti’s In-Touch infotainment system. This cleans up the dash from an excessive number of buttons and knobs, but it doesn’t make for the most intuitive of operating systems. Also, without the available navigation system, the top screen has a rather bland look about it that takes away from the overall appeal of the flowing dash design. The powertrain is where the Q60 really delivers. The Red Sport 400 that served as my test vehicle came with a new 3.0-liter twin-turbo V6 engine tuned to 400 horsepower and 350 pound-feet of torque, which folks running the website zeroto60times.com clocked at 4.5 seconds from zero to 60 mph. With that engine mated to a seven-speed automatic transmission with paddle shifters, the Red Sport’s fuel mileage ratings are 20 miles-per-gallon city, 27 highway, and 22 combined, though the computer showed that I was getting closer to 24 in mostly around-town driving. A 300-hp V6 and 2.0-liter 4-banger rated at 208 horsepower are the other engine choices in the Q60 portfolio. Starting MSRP for the 2017 Q60 is $39,855 (including destination and delivery) for the Q60 2.0t with rear-wheel drive. The top-of-the-line Q60 Red Sport 400 checks in at $52,205. All-wheel drive adds $2,000 to the MSRP. 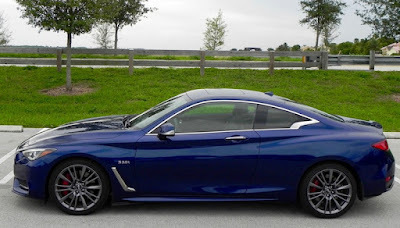 What I liked about the 2017 Infiniti Q60 Red Sport 400: Set in Sport-Plus (one of six driving modes along with Standard, Sport, Personal, Snow, and Eco) it delivers a fun driving experience. Some reviews criticize it for poor steering feedback, but I have found that’s not uncommon for steer-by-wire systems. I experienced no issues. 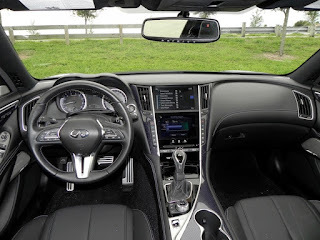 What I didn’t like about the 2017 Infiniti Q60 Red Sport 400: Though the system responded quickly and accurately with voice commands, the operation of the In Touch system overall could use some fine-tuning. I happen to like the two-screen approach (some don’t) but the steps for the various functions need a review to make it more intuitive. 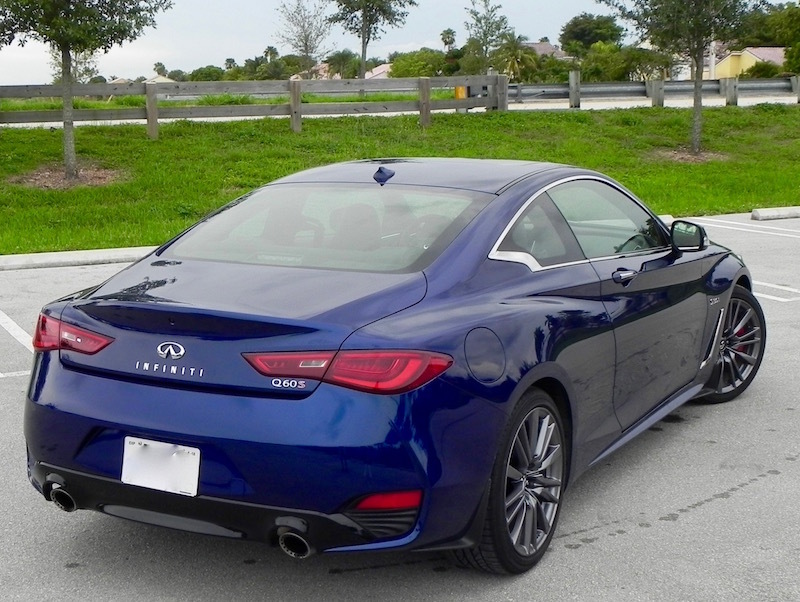 Would I buy the 2017 Infiniti Q60 Red Sport 400? Yes. 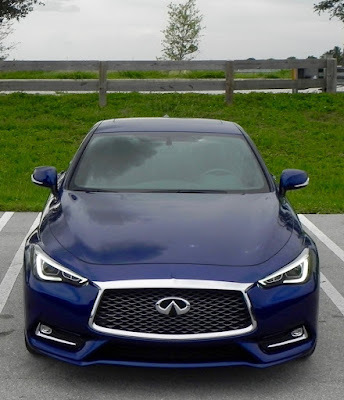 The small luxury segment is a competitive one with lots of good choices, but the Q60 needs to be on your list if you are shopping in the segment. The Camaro is celebrating its 50th anniversary with the 2017 model, though Chevy folks got the jump on the occasion by giving it a full redesign for 2016 that included a new turbo-charged 4-cylinder engine that probably caused conniption fits among Muscle Car purists. 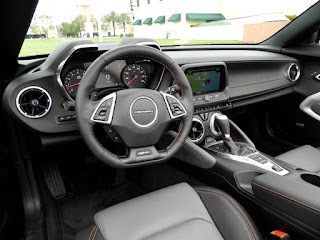 Now, as it moves into the second year of its sixth generation, the Camaro features special “Fifty” badging on the steering wheel of all trims, a teen driving package that allows parents to set limits and review driving habits of the new drivers in the family, and a new exterior color, Arctic Blue Metallic. Also available for an extra $2,695 is a 50th Anniversary package that adds, among other things, special “Fifty” exterior markings, hood stripes and illuminated sill plates, unique 20-inch 50th wheels, special front grille, and orange front brake calipers to give the car a special look. Like its No. 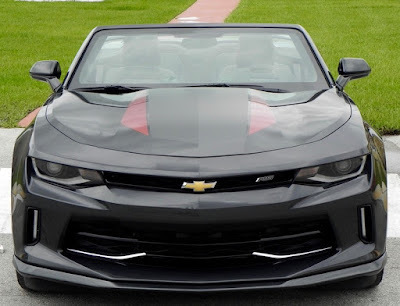 1 rival the Ford Mustang — the Camaro was introduced three years after the Mustang debuted, the Camaro is available as a coupe or convertible, each in several different trims and with three engine choices. The base trim, designated 1LS, and the next two up the ladder, the 1LT and 2LT trims, get the 4-banger as standard with a 6-speed manual transmission with a V6 and 8-speed automatic transmission as an option. 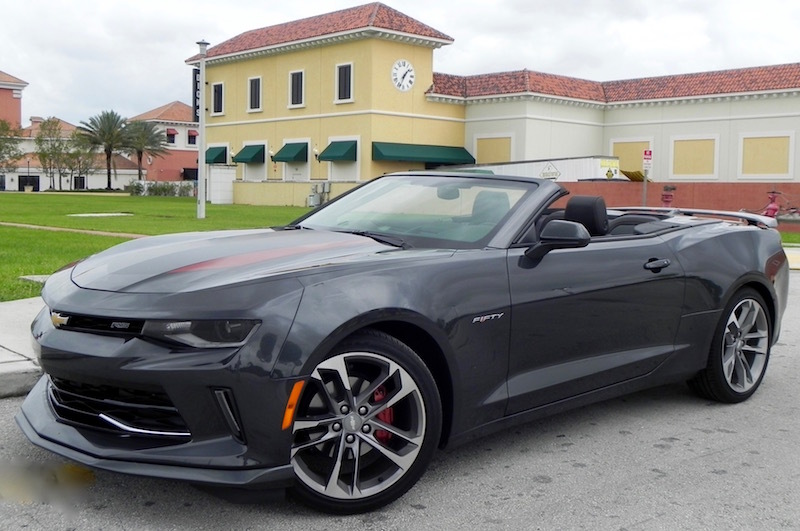 The upper three trims get V8 power with the 1SS and 2SS getting a 6.2-liter, 455 horsepower version and the ZL1 getting a supercharged, 6.2-liter V8 rated at 650 horsepower and 650 pound-feet of torque. Like the coupe, the convertible seats four passengers, though those in the back don’t get a heckuva lot of room (less than 30 inches of legroom) and the driver’s rear visibility is restricted with the roof raised. Thank goodness for the standard rearview camera! Blind spot warning, available in the Convenience and Lighting Package, is a nice feature to have, though setting the side mirrors properly can alleviate the situation. Other than that, the Camaro is comfortable enough for a Muscle Car. There’s a bit more refinement than in the earlier models, of course, but you’re not going to confuse it with the interior of a German luxury car. A lot of hard surfaces abound in the interior. 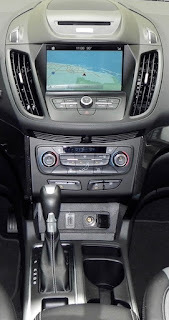 Chevy’s MyLink infotainment system with a 8-inch diagonal screen is not as complicated to operate as some other manufacturers have made their systems, and response to voice commands is accurate and quick. MyLink Audio is standard while MyLink with Navigation and the 8-inch touchscreen adds another $495 to the $35,605 MSRP. 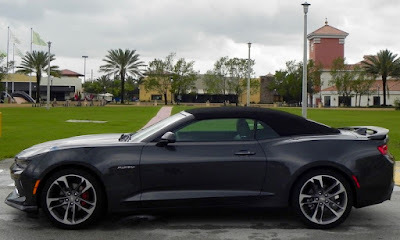 The convertible top operates with the push of a button at the top of the windshield and can be raised or lowered at speeds of up to 30 mph, which is nice if you get caught in an unexpected shower. 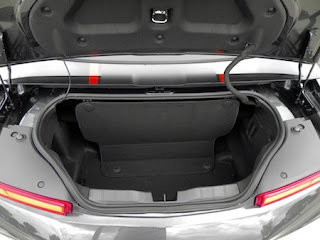 Lowering the roof cuts an already tight trunk space to less than half the available 7.3 cubic feet. You’ll likely going to have to place a second golf bag in the back seat. Standard equipment includes a couple of service visits, capless refueling, the usual safety features as regards to seat belts and air bags, halogen headlights, LED daytime running lights, dual exhaust tips, rear spoiler, push-button start, 8-way driver and 6-way passenger power adjustable front seats, leather-wrapped shift knob and steering wheel, Bose premium sound system, Bluetooth, and Apple CarPlay and Android Auto capability. With the options, my test vehicle came to a total of $45,480 including the $995 destination and delivery charge. 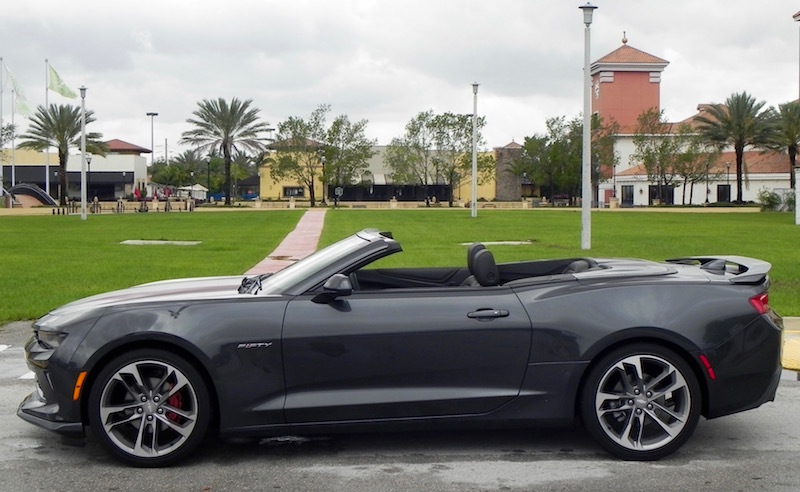 What I liked about the 2017 Chevrolet Camaro convertible: The retro styling, introduced when Chevy resurrected the Camaro in 2010 after an eight-year production hiatus, is eye-catching. Adjusting the temperature for the A/C and heater is accomplished by turning large rings around the large blower outlets on the center stack, kind of a neat touch. 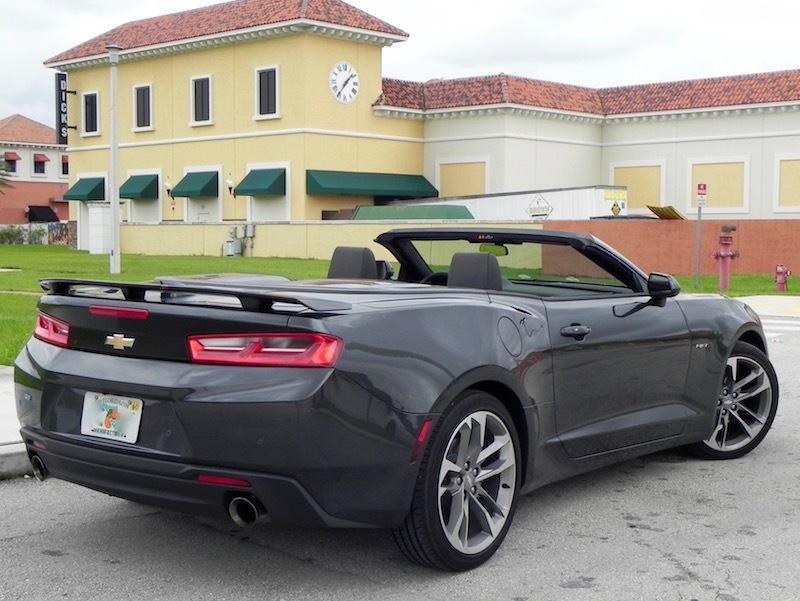 What I didn’t like about the 2017 Chevrolet Camaro convertible: Getting in the backseat is a chore with the roof raised. But you can say that about just about any convertible (or coupe, for that matter). Visibility also is restricted with the roof raised as well, not just out the back but on the sides as well because of the shallow side windows. 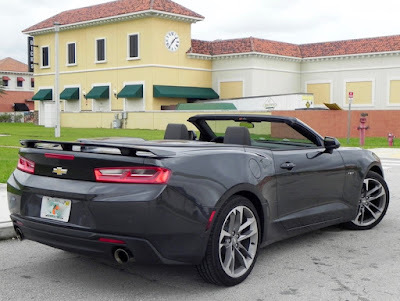 Would I buy the 2017 Chevrolet Camaro convertible: Sure would. I’d get the manual transmission, though. Paddle shifters just aren’t the same.